In last Thursday’s elections, the UKIP vote nosedived from 11% to 1%, largely benefiting the Conservatives whose vote share rose by 7%. The Greens gained 6%, partly through fielding more candidates. The Conservatives now have 49 seats (up 3). The Liberal Democrats 12 (down 1). Labour 8 (down 1). Independent 4 (down 1). Green 1 (lost one, won one). The Conservatives increased their overall share of the vote by 7% and the Greens by 6%. UKIP’s share fell by 10%. A slightly different picture emerges if we examine the vote share per candidate. This adjusts for the different numbers of candidates in the two elections. For example, the Greens fielded nine candidates in 2013 and 36 in 2017. Obviously, the share of the vote is likely to increase if more candidates are fielded. This revised analysis shows a vote share increase of 6% per Conservative candidate between 2013 and 2017. The increase in the Green vote using this measure was lower at 4%. UKIP lost 18% of the vote share per candidate. National. 563 seats gained. Vote share up 13% to 38% from 2013. Shropshire. Vote up from 37,431 in 2013 to 51,215 in 2017. Vote share up 7% to 49%. Won 49 seats, up 1 from 2013 (3 up from 2016). The Conservatives made three gains. Labour councillor Jean Jones had a large personal vote in Broseley, which will now be represented by Conservative Simon Harris on Jean’s retirement. Independent Peter Cherrington saw his vote more than halved in Oswestry East, allowing a second Conservative into the two-ward division. The Tories also regained Oswestry South. The seat had been held by former Conservative leader Keith Barrow but was won by Duncan Kerr for the Greens after Barrow’s sudden departure from office. Vince Hunt won Oswestry West for the Tories by just 9 votes, almost losing to the Greens. 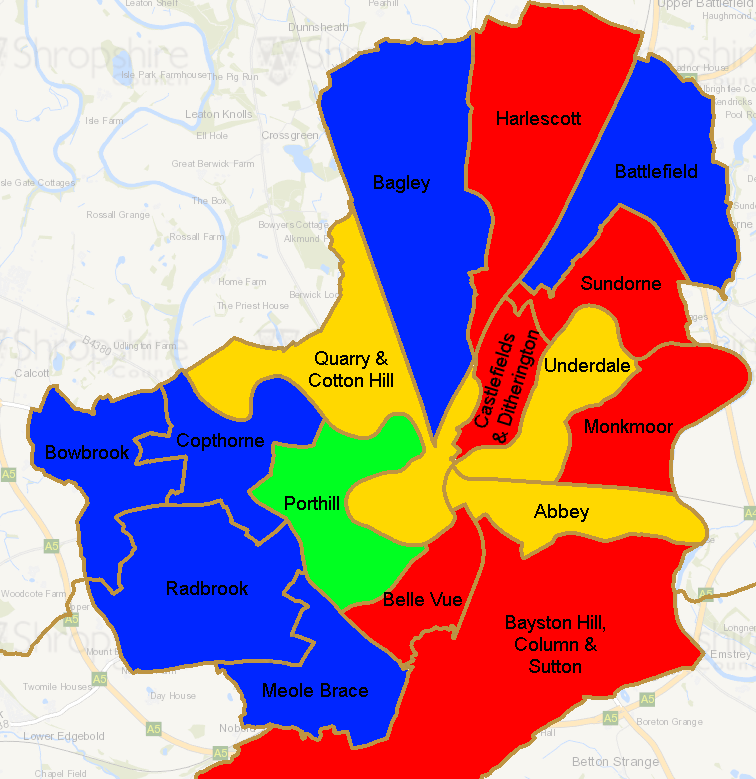 Shropshire: Vote up from 1,080 in 2013 to 7,850. Vote share from 1% to 7%. One seat lost, one gained. In Oswestry South, the Green’s first Shropshire councillor, Duncan Kerr, fell to the Conservatives. The Greens were, however, compensated by gaining Porthill in Shrewsbury. I am glad we still have a Green on the council but regret the loss of a seat previously held by the Lib Dems. National. 382 seats lost. Vote share down 2% to 27%. Shropshire. Vote down from 17,592 to 16,665. Vote share down 4% to 16%. One seat lost. Labour held all its seats on Shropshire Council except Broseley. It now holds eight seats. National. 42 seats lost. Vote share up 4% to 18%. Shropshire. Vote up from 15,979 in 2013 to 21,496. Vote share up 2% to 20%. No change in seats from 2013. The underlying trend was good for Lib Dems locally but it didn’t translate into seats. We had 12 seats in 2013 and 13 after my byelection win in 2014. Now we are back to 12. David Vasmer held Underdale in Shrewsbury after the retirement of Miles Kenny. Porthill, also in Shrewsbury and previously held by Ann Chebsey, was won by the Greens. Detailed Ludlow and Clee results. National: 145 seats lost. Vote share down 18% to 5%. Shropshire: Vote down from 9,338 in 2013 to 944 in 2017. Vote share down 10% to 1%. No seats won. UKIP was in meltdown before this election. It had no Shropshire councillors anyway. The Bridgnorth West & Tasley result is typical. In 2013, UKIP gained 17% of the vote. Last Thursday, the same candidate got just 4% of the vote. In Copthorne, Shrewsbury, the UKIP vote fell from 20% to 4%. 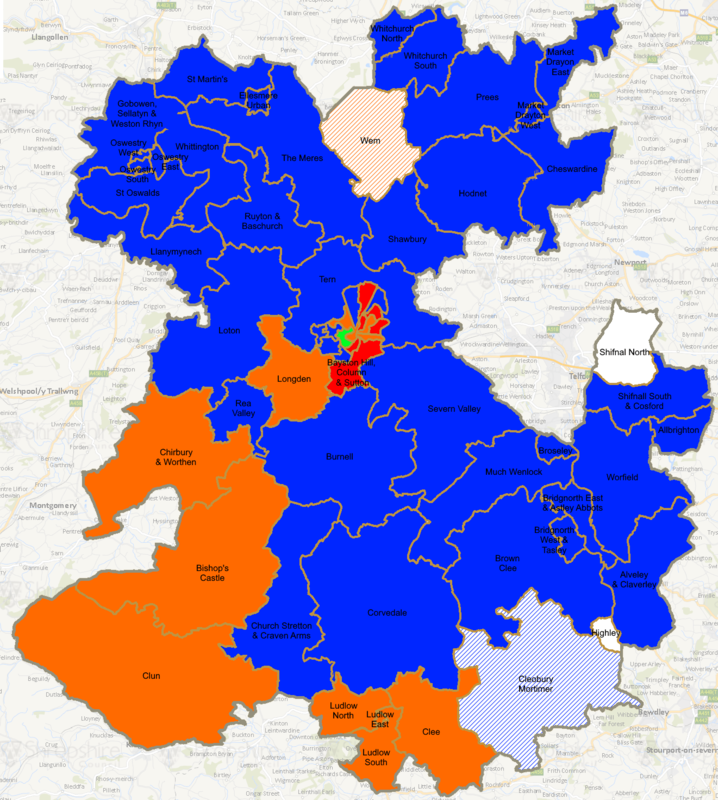 Across the county, most of the former UKIP vote seems to have gone to the Conservatives.
. The six Conservative candidates who were elected unopposed in 2013 and the one unopposed Conservative candidate in 2017 have been excluded from this calculation. Adjustment has been made for multi-member wards.
. The national vote share is based on estimates by Professor John Curtis. As reported by the BBC.